Bellabox January: Lots of Skincare and Haircare Goodies! After my last Bellabox review for the December box, where I mentioned that the box was slightly disappointing to me, it looks like Bellabox has rebounded for January! 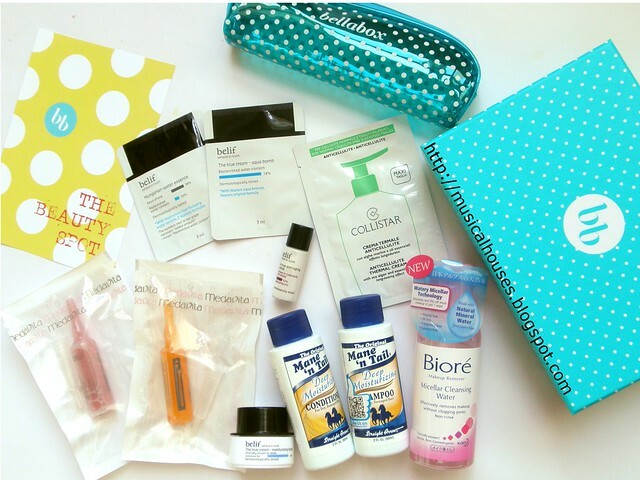 It is full of samples, and a few cute little freebies to boot! Bellabox January: Look ma, so much stuff! 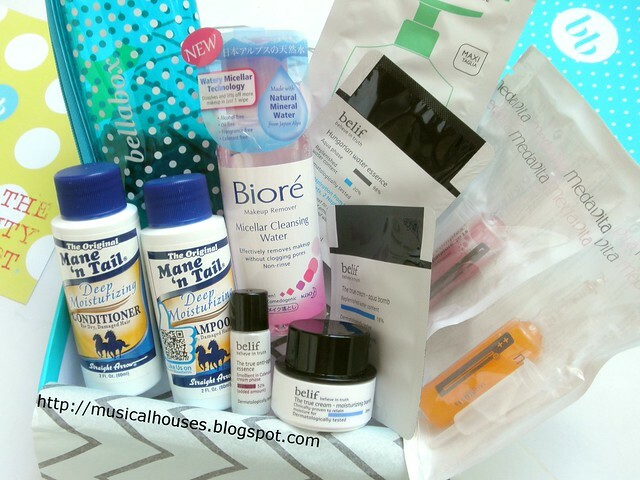 This January's Bellabox has a mix of better-known drugstore brands (like Biore), as well as some niche brands (like Medavita), and some popular-overseas-but-not-so-much-here things (like Mane 'n Tail). And while the products in the box are mostly skincare and haircare, I didn't feel like it was overly repetitive. Apparently some other boxes got fragrance samples too, but mine had no fragrance at all. Some boxes also had Inglot makeup samples (I'm so jealous! ), so I guess I got the box for the skincare junkies! Without further ado, let's move on to see what's in the box! 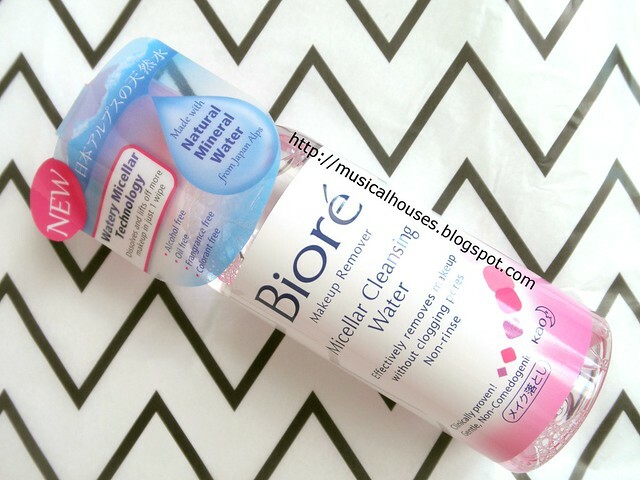 First, we have the Biore Micellar Cleansing Water. This is a a nice deluxe-sized sample (not those puny little sachets, thankfully), and actually quite nifty to have around if you're travelling for a few days. Micellar cleansers are pretty popular these days so I'm sure this sample will be a favourite for many. 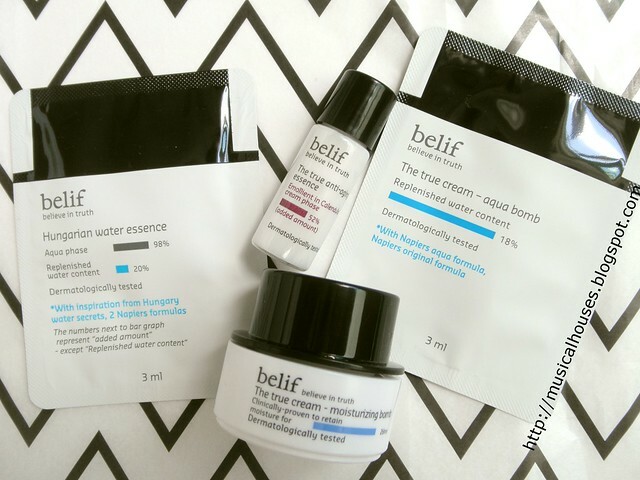 Next, several sample-sized Belif skincare products. There are four different products in here - Hungarian water Essence, The True Cream Moisturizing Bomb, The True Cream Aqua Bomb, The True Anti-Aging Essence - but the trade off is that the samples are the little ones you get one or two uses out of. I suppose it's good for a first try though. Belif has been one of those brands that has been quite heavy on the promotion lately (my Instagram feed seems to be full of bloggers raving about the product that has been sent for review), and from what I can tell, it's a skincare line that sells itself as being natural (although "natural" doesn't have a standard definition within the industry, so it means whatever the individual companies selling products want it to mean). That aside, the products themselves seem fine. And, Mane 'n Tail Shampoo and Conditioner! 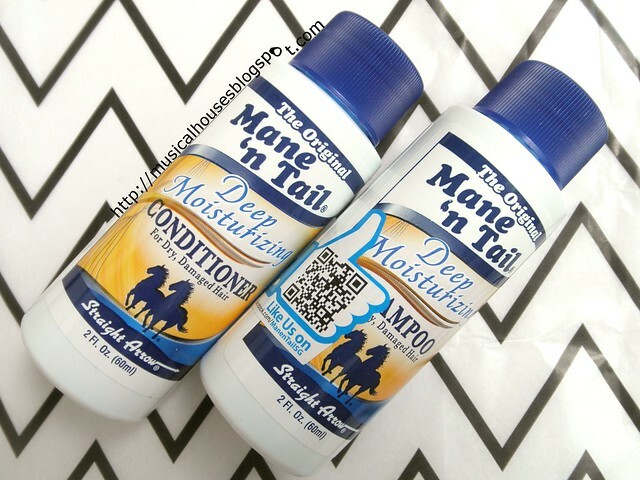 This is actually one of my sister's favourite shampoo/conditioners, and yes, it is indeed called "Mane 'n Tail" because you can use it on your horses as well as your own head. This is the Deep Moisturizing version of the product though, so although the original Mane 'n Tail can be quite drying for certain hair types and is best used on oilier scalps and hairs, the Deep Moisturizing versions aren't as drying. Needless to say, my sister is going to like this. Before you get confused, the next product is a hair product. It's the Medavita Ozogel Complex PH3.6 and SS-Carotene Complex, and it's some sort of treatment for hair. I think you are supposed to mix the two and apply to your hair. 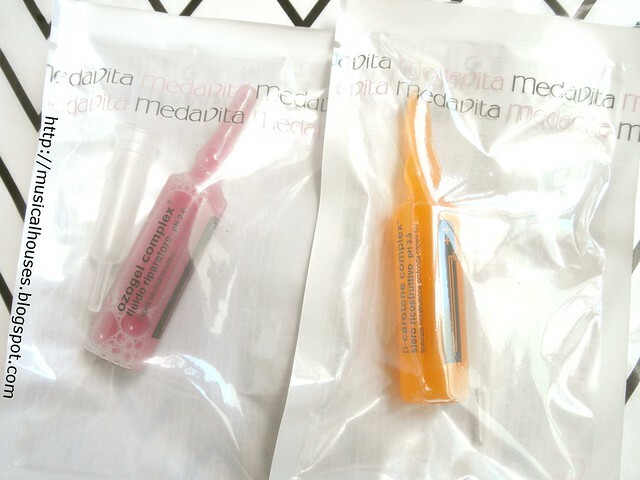 It's definitely an interesting product, and the Medavita brand is new to me as well. Finally, some makeup! This is the Elizabeth Mott It's So Big! Volumizing Mascara. 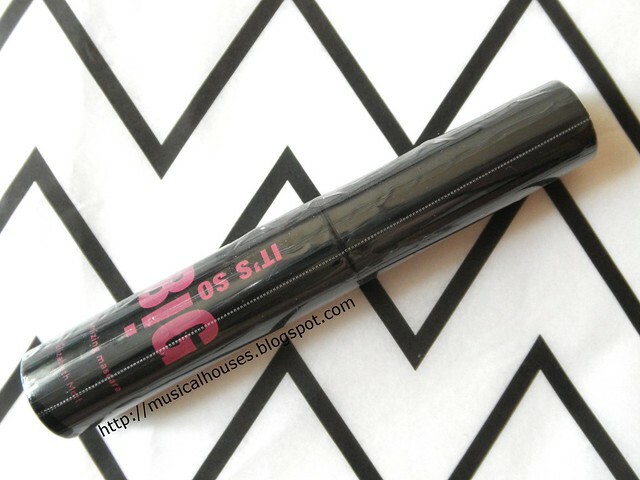 This is a sample size, but I personally am OK with sample sizze mascaras, since mascaras are one of those products that tend to dry out pretty fast anyway. This is also good for travelling or sticking in a makeup bag. 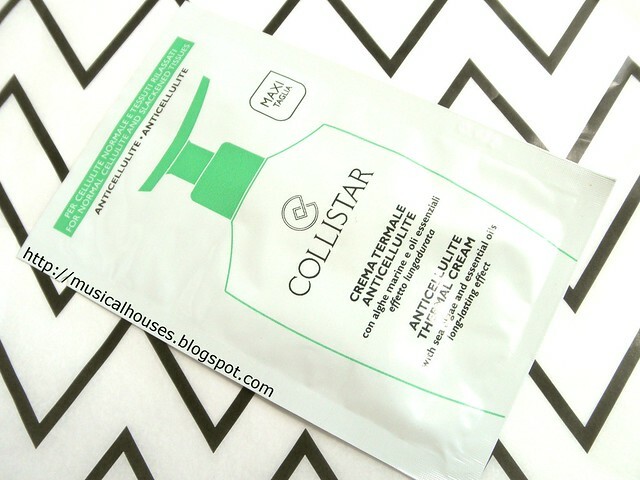 Another niche brand, Collistar, makes an appearance with its Anti-Cellulite Thermal Cream. I'm honestly not too sure what a "thermal" cream is, but I'm going to hazard a guess that it probably produces heat when you apply it, which will give the user the sensation that the cream is helping to burn fat. I'm personally pretty skeptical of all these anti-cellulite creams and topical things, I don't see how they can work from a science perspective, and I've tried one before and it didn't do much for me. But obviously such creams must be selling well, because if not, they wouldn't keep popping up on the market. Lastly, the cute little extra! this is a slim, small makeup pencil case. You can either use it as a makeup pouch (too small for me, with my mass of lipsticks and lipglosses that I put in my bags but never take out), or a pencil case. It's actually pretty decent in terms of quality, and doesn't look like it's going to spoil with repeated usage. Also, that teal colour and white polka dots are really cute to look at! So that's it for my Bellabox January review! I'm pretty happy with this box, because 1) it has lots of stuff! and 2) it has a nice mix of brands, and different product types. This month's box is probably one of their stronger ones, and is everything a beauty box should be, so I'm sufficiently impressed! 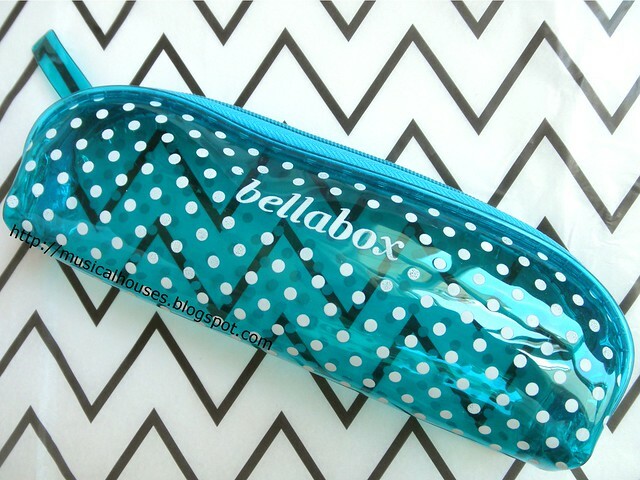 Bellabox's January beauty box will make you feel like you are getting your money's worth!! Great post! You are right! This box is worth it because of the stuffs in it. The variation that other boxes do not have. This is so worth it!